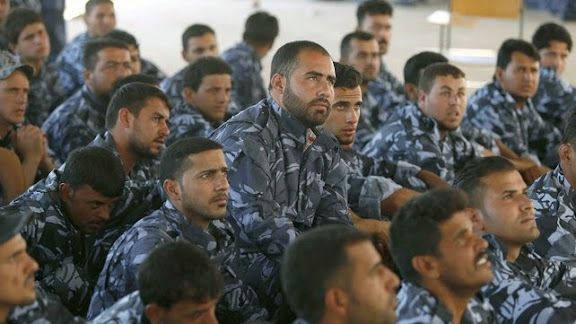 Newly volunteered Shia-Iraqis in Karbala issued new Iraqi National Police BDU-type uniforms, seen viewing a televised speech by Iraqi Prime Minister Nouri al-Maliki. 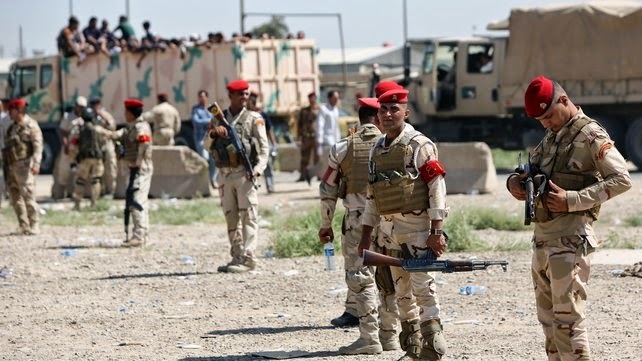 Iraqi Army soldiers at a recruitment location in Baghdad, with Shia-Iraqi volunteers piled into trucks behind them. COMMENTARY: It will be interesting to see how these newly raised volunteers are integrated into Iraq's security structure, and whether or how closely they fill follow the examples of Syria's Popular Commitees and National Defense Force, for which Iran's IRGC takes credit for in conceptualizing along Basij lines. Kurdistan Region Premier Nechirvan Barzani is in Tehran to discuss events in Iraq, where the jihadi Islamic State of Iraq and Syria (ISIS) has seized large Sunni territories and is marching toward Baghdad to topple the Shiite-led government. Iran’s Mehr news agency reported that the Kurdish leader will discuss the ISIS “terrorist group” with Iranian officials. It noted he would also meet with Iranian defense authorities, including top military chief Ali Shamkhani, who heads the Supreme National Security Council. Barzani’s unannounced visit takes place as the Iranian government considers supporting Baghdad against Islamic extremists who have taken the second-largest city of Mosul and remain only about 100 kilometers north of Baghdad. 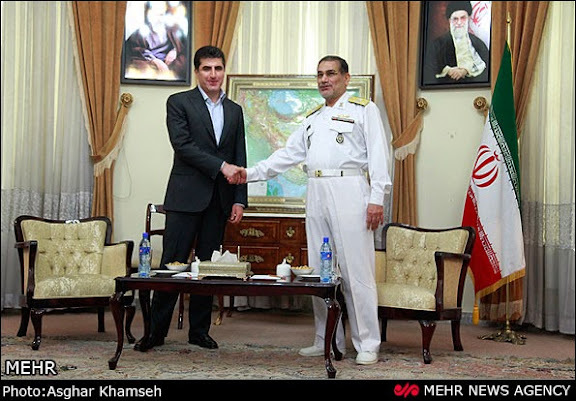 COMMENTARY: Rear Admiral Ali Shamkhani is Iran's Secretary of the Supreme National Security Council. He has previously commanded the IRGC-N and IRIN, and served as Iranian defense minister during the Khatami administration. He holds the coveted Fath medal, as well as Saudi Arabia's Order of Abdulaziz Al Saud. 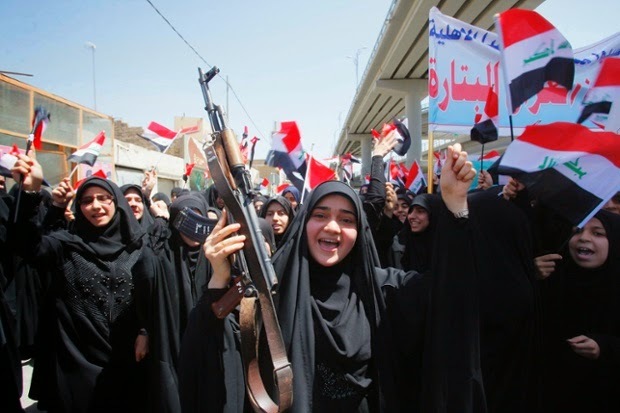 Maliki seems to have next to no chance of forming a government. Diplomatic sources have confirmed to the Guardian in recent days that Washington has also lost faith in its former ally. Iran is yet to declare its hand, but has told Iraqi politicians that it has a list of four acceptable candidates to form a government: Maliki; the former prime minister Ibrahim al-Jaafari; Adel Abdul Mahdi, a senior political figure; or the former US ally and deputy prime minister Ahmed Chalabi. Of the four, Chalabi has the support of many Kurdish leaders and has strong links to Iran. His links to Washington were severed more than a decade ago, after he helped persuade the Pentagon to invade Iraq. His return to political centre stage would be a remarkable twist in the contentious history of the former favourite of George W Bush. COMMENTARY: If this reporting at the Guardian is indeed accurate, the inclusion of Chalabi is sure to raise eyebrows in Washington. It would further the view that he is an Iranian asset. Given his checkered and highly controversial background, were he actually selected it might be said as shocking as ISIL's motorized dash last week down Iraq Highway 1.